← Multicolored Lights in Various Formations Photographed. VIDEO CLIP OF GELATIN-LIKE OBJECT WITH BLINKING LIGHT. PHOTO & ENLARGEMENT OF GELATIN-LIKE OBJECT. Description: On Aug 6th around 8:30 to 9 PM the sun just had gone down here in Sun Valley, CA. My brother in law and I witnessed a UFO that had landed about a mile away in the water and power plant on Sheldon street which is a block from my house. I have attached 3 photos and a video. You can see 2 objects on one photo and also if you zoom into the photos, you will see an alien entity staring at you and you will also see a square door in the UFO. So my brother in law pointed it out and we started snapping pictures and filming the thing. 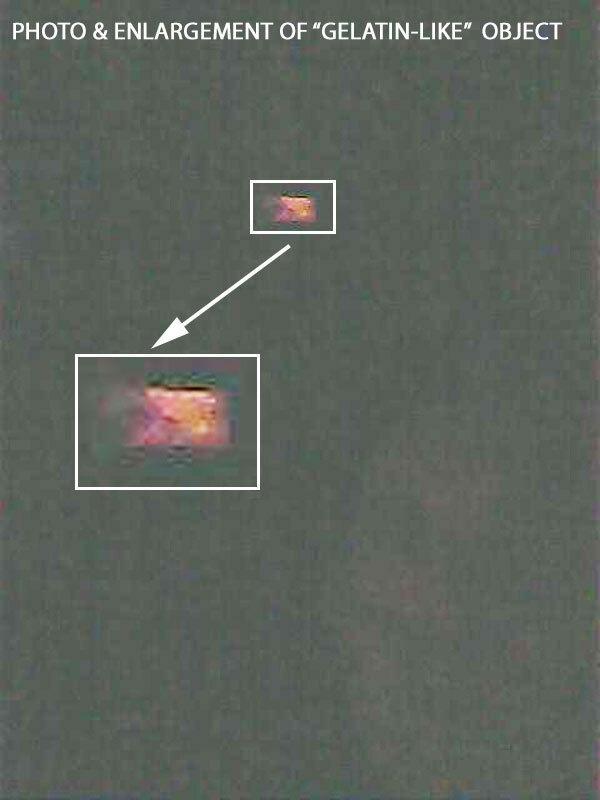 It looked like gelatin and was blinking orange-like, red and white. Then it was hovering and would move about 10 feet. Then it zipped over like 25 feet turned this light blue kind of as if it was in night vision or stealth mode and then just lowered to the ground. I didn’t bother to go there and see it closer. The water and power plant has a big fence around it. Also I saw a red orb a few months before this sighting although I couldn’t take any photos because my battery was dead and it was gone within 45 seconds! If you have any questions, feel free to ask away . I would like others to see my photos. I have seen the same UFO on another site. The lady that took it lives in San Jose, CA and saw it roughly a year after my sighting. Note: The photo and video support strengthen the case that the witnesses saw something unusual. The object appears to be of an “asymmetrical” shape. The video also shows a quick blinking light. The only draw back is that the video and photos were of low resolution making “detailed analysis” more difficult. This entry was posted in glowing red, Photos, Possible Landing, Strange Shaped, UFO Sightings 2019, UFO sightings California, Unidentified, Video Clips and tagged Blinking light, Erratic moving, Hovering, Red lights, White lights. Bookmark the permalink.